Now, back to business! 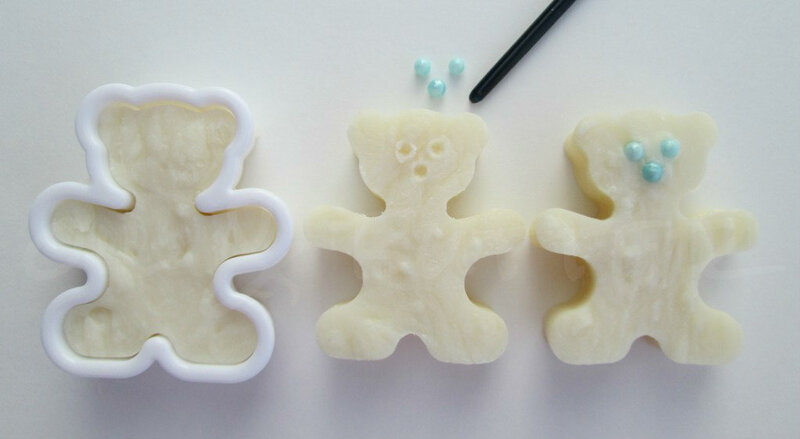 The little bears I teased you with earlier are, in fact, soap! I hope you’re not too disappointed Kirppu! Maybe I need to bake a real batch of cookies to make up for it?! 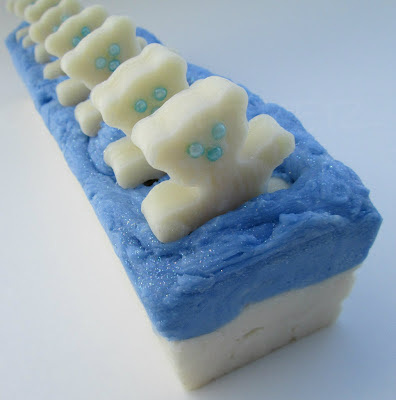 I made a separate batch of hot process soap to embed the polar bears into. I left the bottom layer uncoloured and used ultramarine blue to color the top layer, the soap is fragranced with an icy/woodsy/sugary fragrance combination. 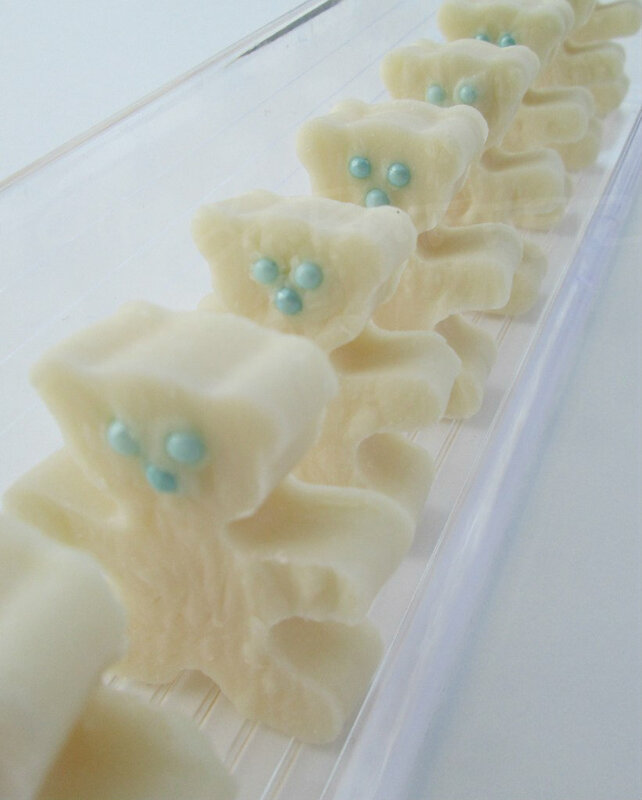 Now that I look at them, I think they would make really cute little baby shower favors too! And....because I had so much fun doing the last giveaway, I thought it would be fun to do another one! Can you help me come up with a name for this soap? If I pick the name you suggested, I'll send you some soap! All I've come up with so far is Arctic Ice but I'm not crazy about it....I'd love your suggestions! Hmm, how about North Pole or Soapolar (ok that's bad but funny hehe!)!! Your suggestions are better than mine...ha ha! I had a complete mind block trying to come up with a fun name for this one! Aw, thanks Heather...they were really fun and easy to make! I really like Arctic Bathtime, it totally suits the soap! I would say "Blue Peak-a-Boo" :) because they are just too cute! Thanks Roxana, I get a little carried away sometimes but it's fun :D I really like your name suggestion, Peak-a-Blue would be cute too! See, you guys are way better at this than me! One of the most beautiful HP soap I’ve ever seen! I would propose “Bubbly Bear”. Thank you so much :) Bubbly Bear is an adorable name too, this is going to be so hard to pick just one! 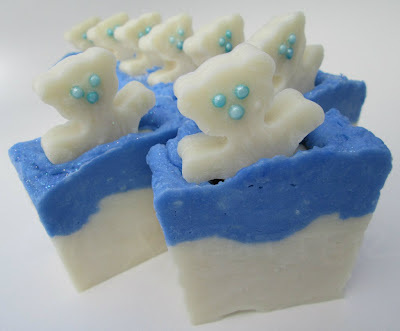 Your Soap is so cute,i love the polar bears. Cute polar bears, Cee Gee! You are so creative. Hmm ... if this is a holiday soap, how about "Beary Christmas" for a name? Oh, that name would really suit the soap too, love it! Thanks for the suggestion Jenny! 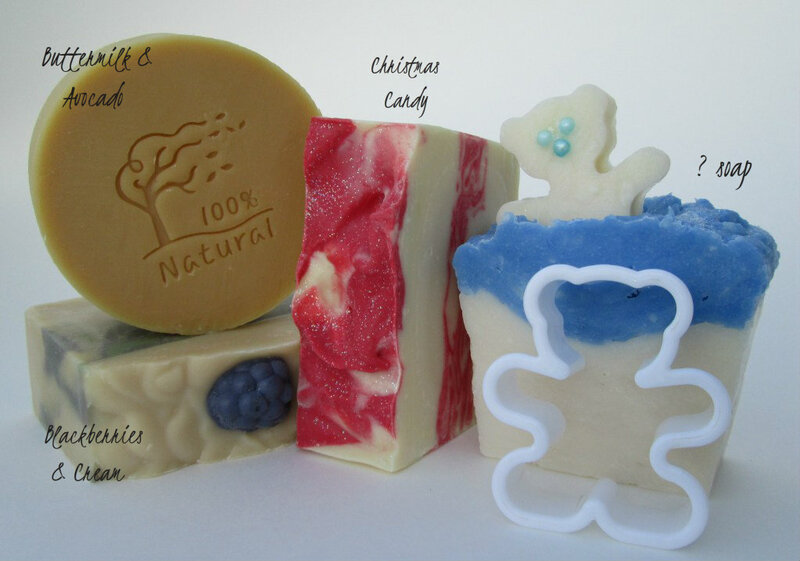 Once again,your soap came out wonderfully! And my admiration goes to this one even more,because it's HP soap. If you hadn't told,I would have believed it was a CP. My associations are really very similar to these above,so it's hard to be original. Thank you so much Maja, I really appreciate your nice comments! I love your suggestions too, especially Polar Bear Bath. Hmmm, this is going to be harder than I thought, everyone has suggested such great names! What about: Polar Indulgence? Hmm,sounds exactly how it looks! those are so cute, Cee Gee! Is the scent more sweet than woodsy? "Beary Sweet" or "Polar Beary"..that's all I got, lol. I love those Kalla, cute suggestions! I would say it's more woodsy than sugary. This is sooo hard :/ The only name I an come up with is "Polar Parade". It looks like the bears are marching in the first pic. Thank you so much Chrissy! That exact name also crossed my mind too, great minds think alike ;) I really like it too! This is getting harder and harder, so many good names to consider! Keep them coming you guys, great job! Oh my gosh, Beary Clean/Bearly Clean is soooo clever..ha ha! Good one Chrissy! Thanks! I've been looking through your blog, and you have so many creative soaps! I love reading your posts. Great work! OMG, the most generous giveaway EVER! So jelaous of the winner, who ever it'll be! Hi there! Sometimes embeds will fall out because they are different kinds of soap shrinking at different speeds. Are you embedding an HP log into HP soap? I would try putting your log embed in the freezer, and taking it out a little bit before you need it so that it develops moisture on the outside, which may help it stick to the surrounding soap. HP is a tricky one, you have to work fast because it cools so quick. Hope that helps, good luck!